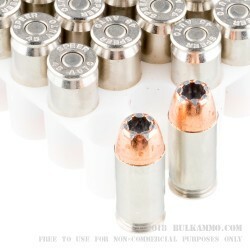 One of the Ultra-premium .45 ACP loads available on the market in the venerable 230 grain JHP loadout. This round was made specifically to cater to the proliferation of short barreled .45’s that have made it to the market of late and are dominant for concealed carriers throughout the United States. 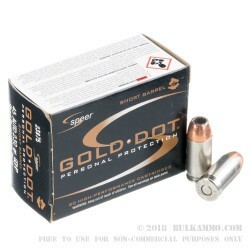 This ammunition makes it clear to the consumer market why it is so well received on the law enforcement market: it simply performs, regardless of the scenario. 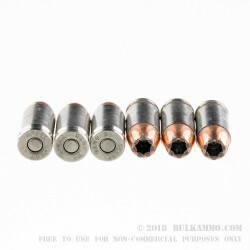 Considering this is ammunition made for a short barrel, and it outperforms most .45 ACP made that is tested out of longer barrels, it’s no surprise that Speer retains such an incredible reputation for being innovative and powerful. The penetration of more than 10 inches in a 10% gelatin; the incredible uniformity of the expansion; the reliability of the expansion time and again; and the total wound channel diameter makes this a stellar round. 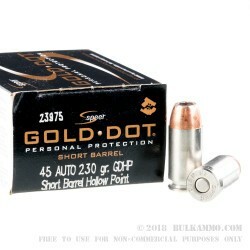 The fact that it’s made for performance out of a shorter barrel, when other rounds can’t even achieve nearly the same results out of faster longer barrels makes it a good candidate for your money in the self-defense/personal protection space.